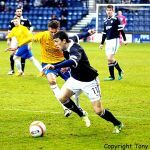 Raith pulled back a two-goal deficit to earn a point from today’s Fife derby against neighbours Cowdenbeath, although fans bidding farewell to 2012 can reflect on a 90 minutes which showcased some of the best and worst aspects of the current Raith side. A patchy and inconsistent home performance allowed Cowdenbeath time and space to create good openings, while Raith’s front four recreated the flowing football displayed at Firhill two weeks earlier only for spells in either half. 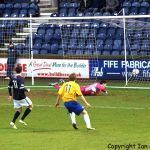 Grant Murray’s side have shown an impressive ability to score against any defence this year – Raith created a host of chances again today. Equally noteworthy again though was the brittle nature of the team’s spine – Cowdenbeath’s second goal illustrating vividly how pacy passing sides can carve chances right through the centre of Raith’s formation. Simon Mensing was recalled at right-back, with Jason Thomson missing his first game of the season, in a starting eleven otherwise unchanged from the excellent display against Partick in their last competitive outing. Cowdenbeath made three changes from last week’s home draw against Livingston – Miller replacing Adamson at left-back, Colin Cameron dropping himself to the bench for Marc McKenzie, and Jamie Stevenson also bolstering the midfield in a 3-5-2 formation aimed at controlling the middle of the Starks Park pitch. 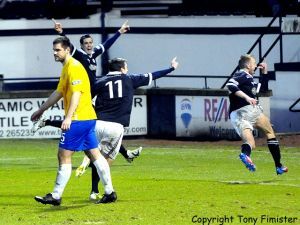 After last week’s postponement, the surprise of the opening stages was the flat-ness of the Raith display. Cowdenbeath’s midfield triumvirate of O’Brien, Milne, and Stevenson established themselves early, outnumbering Raith in central areas and springing Miller and McKenzie on early raids toward Laidlaw’s goal. Also notable was the number of mis-placed passes – Smith and Grant Anderson both wasting possession or chasing poor attempts from team-mates to spread play in their direction. 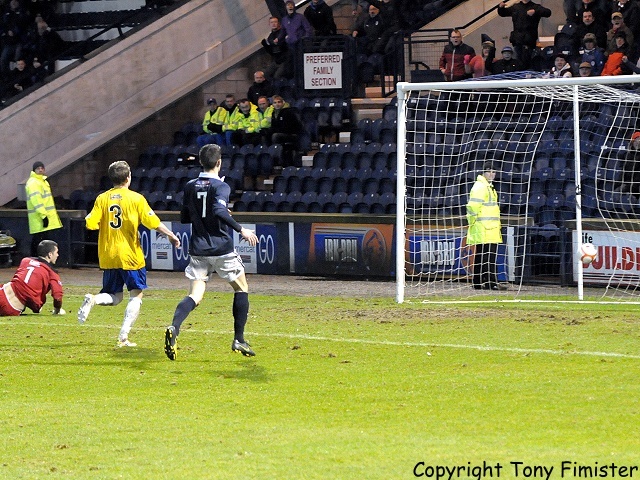 Graham’s rising shot from a Smith centre after five minutes was Raith’s only threat on the visitor’s goal in the opening exchanges. The Blue Brazil opened the scoring on ten minutes. Although possession was gifted to McKenzie via a loose Spence back-pass, the Cowdenbeath front-man still had plenty to do. Brushing off a partial Ellis challenge, he squared to Milne amongst a crowd of retreating defenders, who stroked a neat finish beyond Laidlaw. 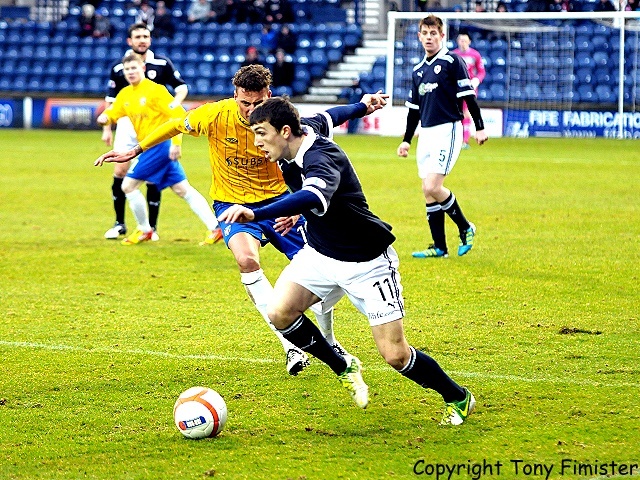 Conceding an early goal couldn’t lift Raith from their lethargy. After fifteen minutes, Smith gave the ball away cheaply on half-way, allowing Coult to test Laidlaw from 20 yards. 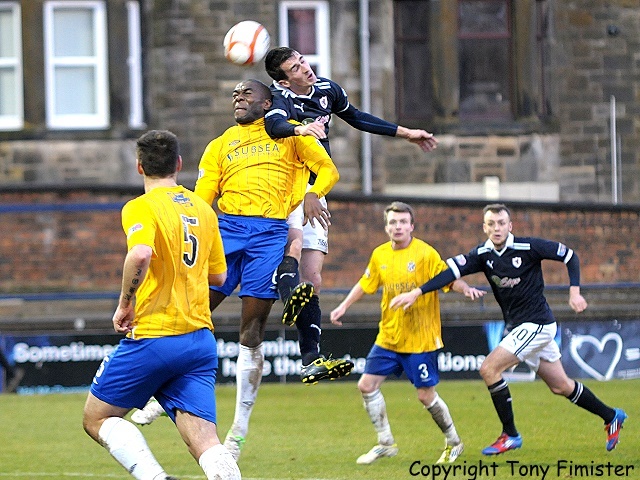 Moments later, a forward surge from Joe Mbu allowed McKenzie to cross, although Walker cleared any danger. With Cowdenbeath’s midfield three exercising such control in the middle, Raith could only gain from playing the game down both flanks. 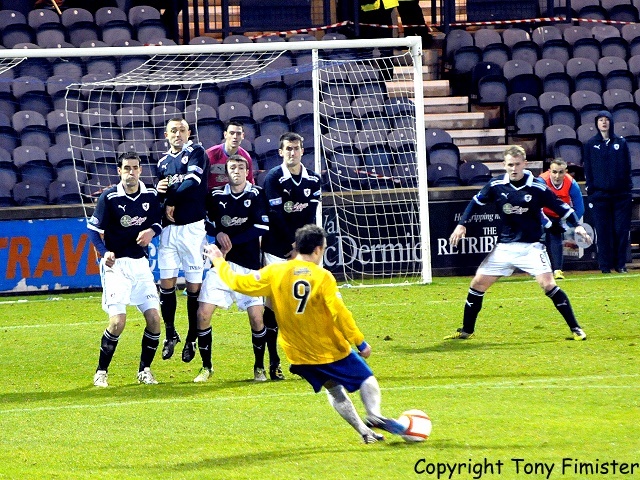 Having been second-best for the first twenty minutes, Raith passes began to connect and the momentum began to shift. Grant Anderson particularly became the focal point – narrowly caught offside from a Graham flick, and crossing for Smith to fire just over on the half-hour. 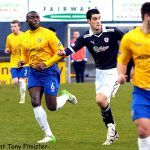 Following a foul on Spence, Joe Hamill floated a 30-yard free-kick over the wall but the wrong side of visiting keeper Flynn’s left-hand post. 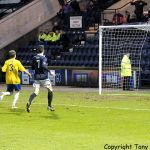 Raith’s clearest chance of the opening period came in the midst of their best spell of passing play on 32 minutes – Graham displaying a velvet first touch and turn to play in Anderson, who’s shot and Spence’s follow-up were both saved by Flynn. With Raith on top, and against the run of play, Cowdenbeath extended their lead. After a throw-in in front of the main stand, Stevenson cut inside Malone, exchanged a one-two with McKenzie and drew the foul inside the box from Ellis. 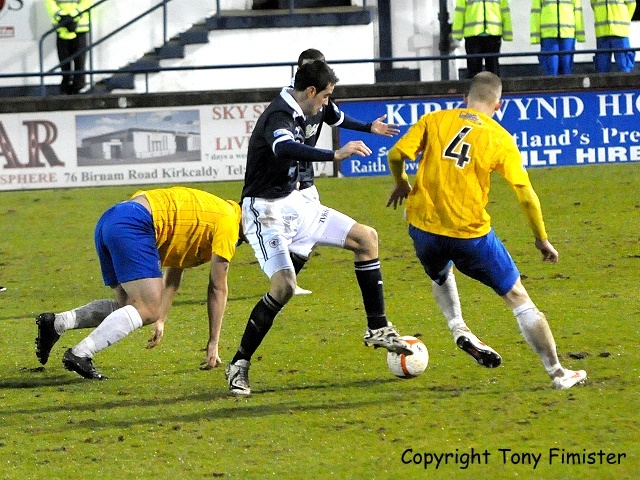 Referee Calum Murray had no hesitation in pointing to the spot, booking the Raith defender for his trouble. 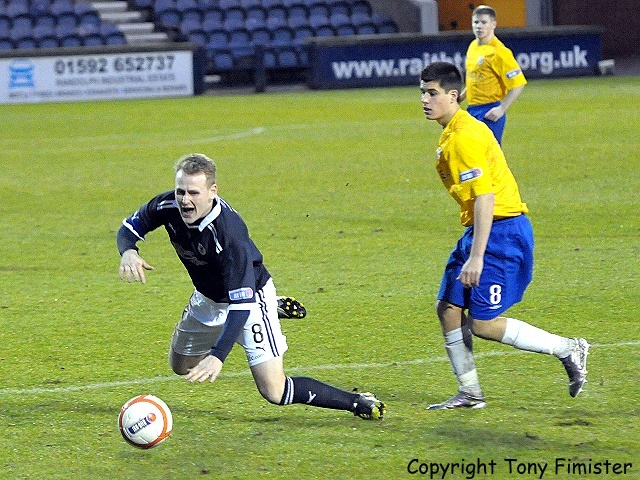 Although Ellis committed the foul, he was left horribly exposed by his colleagues defending the Raith 18-yard line. Stevenson picked himself up, and dispatched the spot-kick for his sixth goal of the season. A two-goal deficit at the half may have been harsh on Raith on the balance of play, but two soft defensive goals coupled with a failure to convert during twenty minutes of vigorous attacking play left manager Murray with the more difficult of the two half-time team-talks. Whatever was said in the home dressing room at the break (Raith players were out well before 4pm), the second half saw much increased pressure and application. 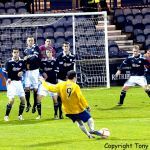 Far greater energy was in evidence straight from the referee’s whistle, the festive charity and goodwill shown to Cowdenbeath early in the first half now only a memory in a much more aggressive Raith display. Walker and Hamill patrolled the central third with urgency, snapping into tackles and closing down spaces. Raith’s support in the South Stand, disgruntled for much for the opening 45 with the sluggish nature of the home performance, sensed the higher tempo, roaring their team forward. Murray had also tweaked his front line to great effect – Smith was moved inside to shadow Graham, with Spence moved to the left-wing. 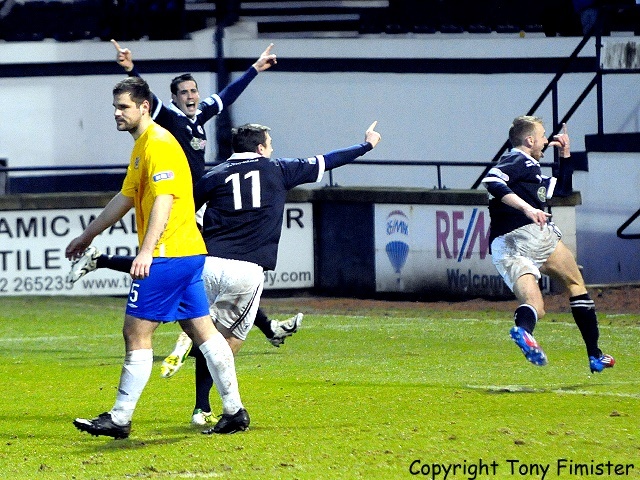 Within minutes, Raith were back on terms. Raith had already strung several passing moves together, before Smith cut inside to create space to cross, his centre finding the space between the two Cowdenbeath centre-halves. Hill rose well to head powerfully beyond Flynn. 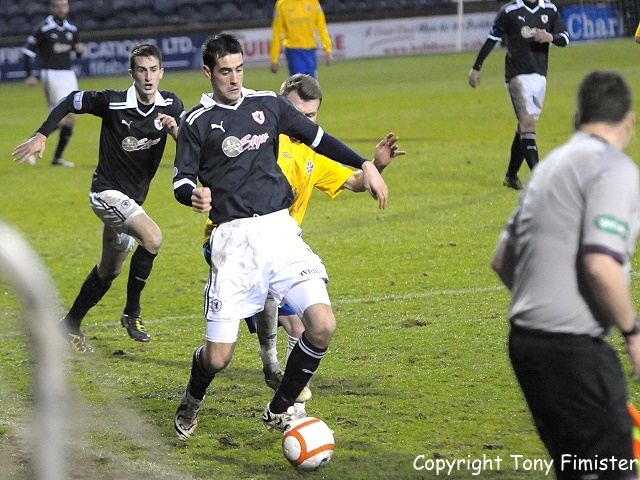 Within three minutes, Raith’s finest passing move of the match drew the home side level. After winning a 50/50 challenge in midfield, Smith burst forward. With both Graham and Spence making intelligent runs ahead, Smith slipped the ball to Graham, who drew his man before releasing Spence to fire a fine finish high to Flynn’s right-hand side. 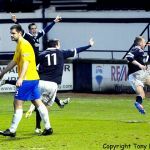 With the half only eight minutes old and with Spence‘s 11th goal of his ever-improving season, the match had swung in Raith’s favour. 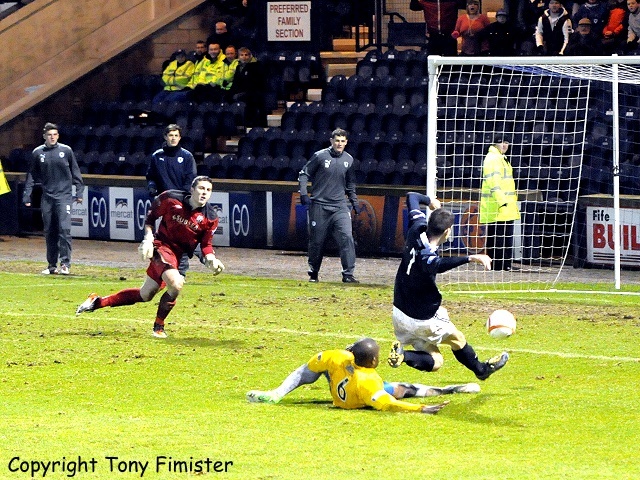 For a spell, Raith looked the more likely to score a third. Smith then Mensing crossed dangerously into the Cowdenbeath box, with the Blue Brazil recalling Armstrong and Mbu into an orthodox back-four in recognition of Raith’s momentum. Graham was a regular threat, with a succession of excellent touches, controlling direct passing from Raith’s back-line and providing a platform for regular Raith surges. 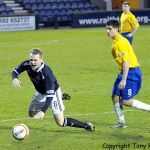 The second half of Raith’s season depends largely on Graham’s continuing form in front of goal, and his central role in much of Raith’s possession play. 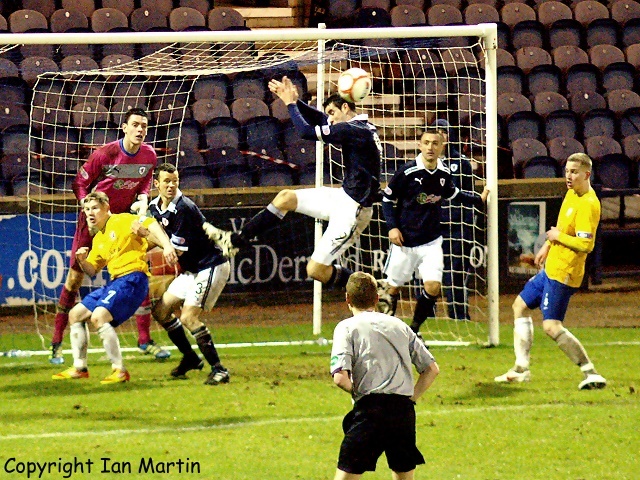 An Anderson shot struck Cowdenbeath right-back Cowan‘s midriff; with Raith players indicating hand-ball, a well-placed referee Murray waved away the protests. 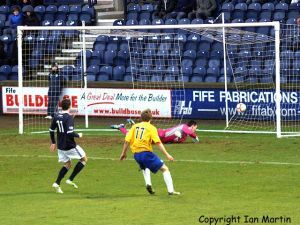 Seconds later, Anderson again cut inside forcing a flying save from Flynn; Graham’s rebound clattered the cross-bar although Raith’s top-scorer was flagged off-side. 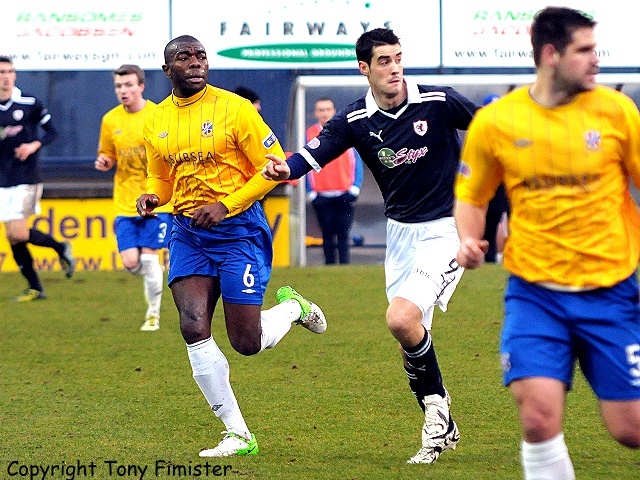 As in the first half, Raith could only sustain their attacking momentum for twenty minutes. The tide turned again. 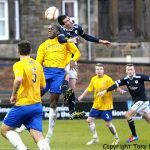 With the first onset of rain, and having steadied their own ship following Raith’s impressive start to the second half, Cowdenbeath’s yellow shirts swept up field. Waves of Cowdenbeath pressure broke against Raith’s creaking harbour defences – Mensing (who would take home the sponsor‘s man-of-the-match award), Grant Anderson, and Malone all picking up bookings as Coult, McKenzie, and Stevenson each sought to plunder a third for the visitors. On sixty-six minutes, with the visitors’ best chance of the half, Coult squeezed a shot wide following a last-ditch tackle from Ellis to block Brett’s clear sight of Laidlaw’s goal. The final twenty minutes saw chances at both ends. The match became increasingly stretched on a wet surface populated by two tiring midfields. Clarke, on for Spence on the left-wing, dragged a shot across Flynn’s goal; Cowdenbeath’s Brett failed to connect when released by McKenzie; and Raith keeper Laidlaw struggled to deal with a skidding cross, Ellis thumping clear. 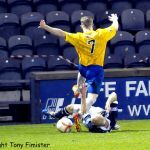 Grant Anderson caused panic in the visitors’ defence, beating his opposite number to the by-line, his cross palmed onto the cross-bar by Flynn. The match ended level, neither side able to conjure a winner in the final stages. 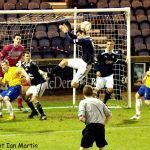 Late cameos from Colin Cameron and twenty-year-old Spanish striker Pablo Navas steadied Cowdenbeath in the final moments, with Raith’s final efforts to sneak a winner lacking the cohesion and drive of their earlier periods of supremacy. Both sides can reflect on chances missed and opportunities spurned, although in reality neither side displayed sufficient quality for sustained spells to claim they deserved the three points. 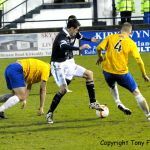 With a trip to East End Park beckoning in mid-week, manager Murray must seek to instil greater consistency and strength from his team if Raith are to begin 2013 with a win. Seasons greetings to you all from RRA and the web updates. An early foray by McKenzie is cleared by Malone. A Miller run down the left is cleared by Anderson. Smith glides past two defenders, passes to Graham who's shot goes high and wide. Mensing shows some skill beating two players to pas to Anderson, but his cross is wide. 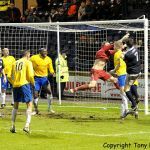 McKenzie terrorized the defence, despite Laurie winning a tackle he crossed for Milne to score for ten yards. 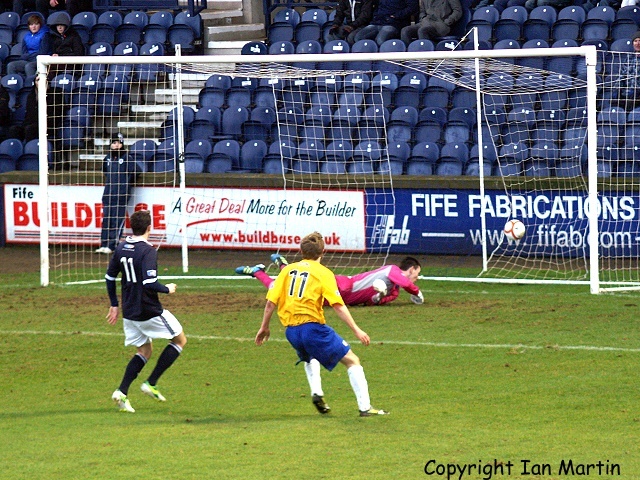 Graham bundles the ball past the post from a corner. A blunder at the halfway line sees the ball played throw to Coult who's shot from twenty-five yards is saved by Laidlaw. Mbu breaks from midfield, passes to McKenzie who's cross is cleared by Walker. McKenzie crosses from the right, but the ball is caught by Laidlaw. Mensing from thirty yards out beats three and passes to Graham, he didn't contact well and his strike was caught by Flynn. Hamill from a thirty yard free kick floats the ball over the wall but past the post. Smith comes close from inside the box, Flynn to the rescue. Anderson surges into the box to force a corner. Spence goes on a mazy run beating four but his pass to Walker is intercepted. Graham crosses into Anderson, his And Spence's shots are saved. 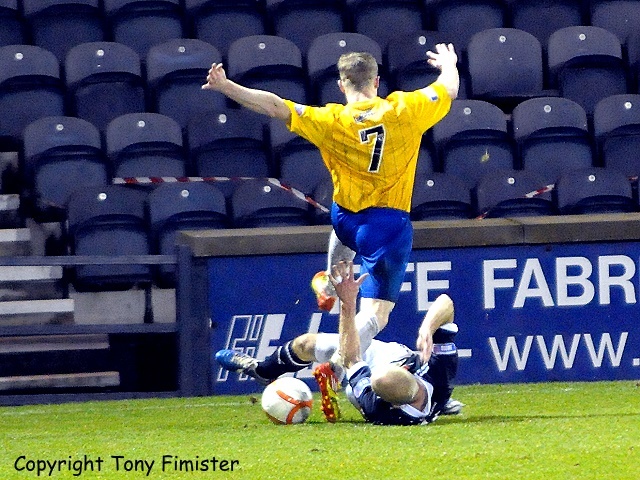 Hamill wins the ball in the Cowdenbeath half a diagonal pass to Anderson is snuffed out by Flynn. 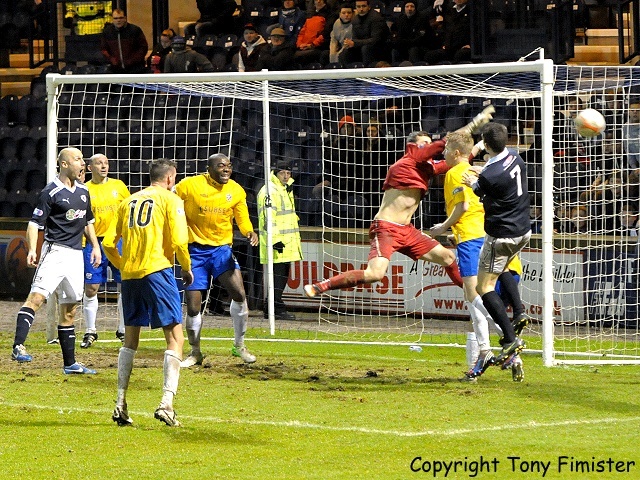 Malone comes to the rescue intercepting Coult in the box. Grahams header comes out to Spence, however his shot from outside the box flies over. Ellis booked for bringing a player down in the box. A string of seven passes sees the final pass to Graham blocked. Rovers deciding to look menacing in the opening minutes. Smith crosses for Hill to head home from six yards. A wonderful mazy run from Smith sees his pass unselfishly passed by Graham to the on running Spence who smashed the ball home from six yards. A twenty yard Cowdenbeath free kick sails over the bar. Action in the box first from Smith's cross then from Mensing, both attempts cleared. Graham through, shoots the deflection goes to Anderson who hits the bar, alas he was offside. Coult shoots wide from inside the box. Anderson has the ball in the net but chalked off because there were two balls on the Pitt. 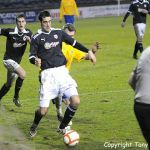 Clarke shoots across the face of the Cowdenbeath goal. Mensing loses the ball to McKenzie at the edge of the box, Laidlaw secures. Malone hits a tame shot into the box, Flynn catches. O'Brien off, Cameron on. Hamill off, S. Anderson on. A corner from Smith sees Grahams header go over. +2 The last play of the game sees Smith's floated thirtyfive yard free kick held by Flynn. Laidlaw, Mensing, Malone, Ellis, Hill, Hamill, G. Anderson, Walker, Graham, Spence, Smith. Subs, Clarke, S. Anderson, Callachan, Donaldson, McGurn. Flynn, Cowan, Miller, O'Brien, Armstrong, Mbu, McKenzie, Milne, Stevenson, Coult, Brett. Subs, Garcia, Navas, Linton, Cameron, Wight.